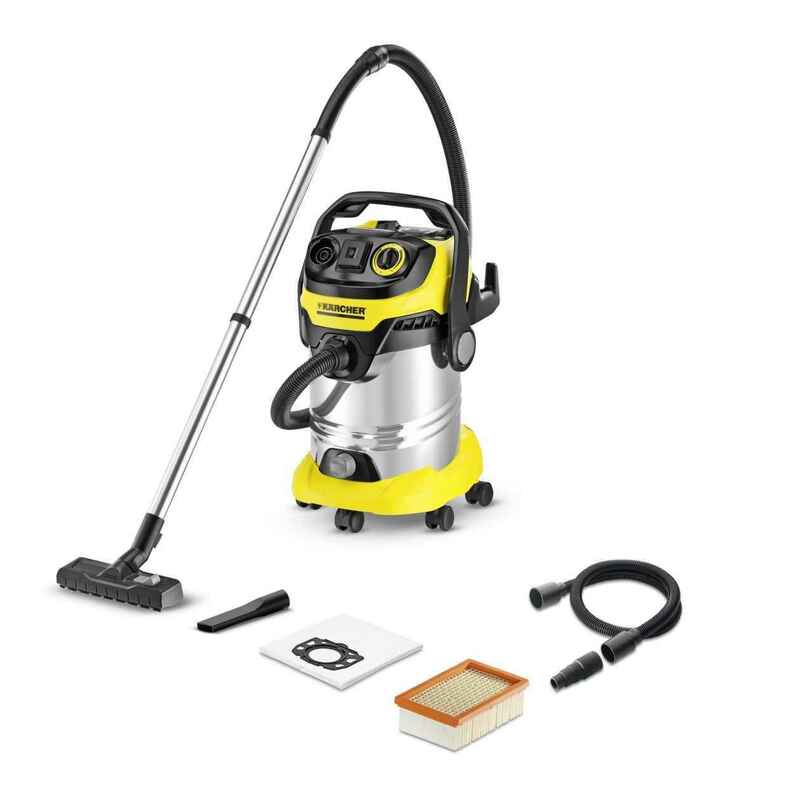 The high-end WD 6 P Premium multi-purpose vacuum cleaner impresses with its extremely high suction performance of 2000 watts, with an actual power consumption of only 1300 watts. The vacuum cleaner is equipped with innovative filter removal technology, with the flat fold filter contained in a removable cartridge in the device head. By folding out this cartridge, the filter can be removed in seconds without any contact with dirt. Dry and wet dirt can be vacuumed without having to change the filter. Thanks to the integrated filter cleaning function, the dirty filter can be efficiently cleaned by pressing the clean-out button, quickly restoring the suction performance. The socket with automatic on/off switch allows you to work with connected power tools. 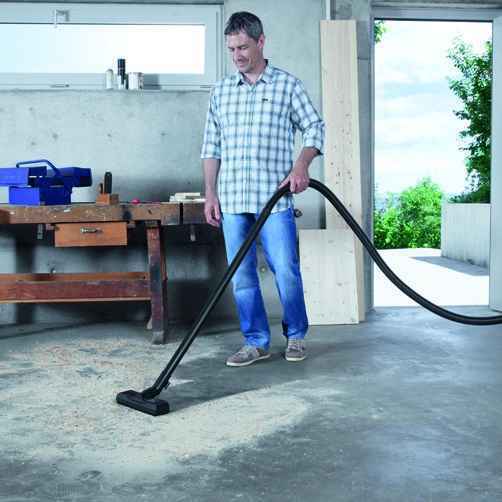 Dirt resulting from planing, sawing or grinding work is vacuumed directly. 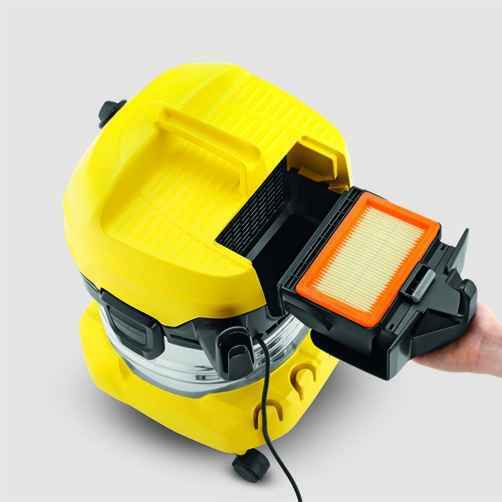 The suction performance can be adapted to requirements, both for standard vacuuming operations and for use with power tools. Other highlights: 30-litre stainless steel container, newly developed accessories for the best cleaning results, removable handle with protection against static, drain screw for large water volumes, parking position and much more. Quick and easy removal of the filter from the filter box – without contact with dirt. For wet and dry suction without changing the filter. Removable handle. Offers the possibility of attaching different nozzles directly on the suction hose. For easy vacuuming even in the tightest of spaces. Powerful pulsed air blasts move the dirt from the filter into the container at the push of a button. Suction performance is quickly restored. 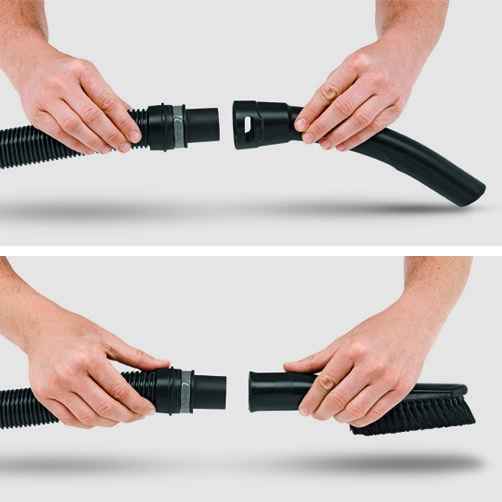 The practical blower function helps wherever vacuuming is not possible. Effortless dirt removal e.g. from a gravel pit. Quick and convenient temporary storage of suction tube and floor nozzle during breaks.